The use of data to inform the strategies and approaches is critical to designing a successful consumer-led family planning program. NURHI utilized the concept of ideation to design effective messages and approaches to target key motivational factors that influence behavior for contraceptive use. Ideation refers to how new ways of thinking (or new behaviors) are diffused through a community by means of communication and social interaction among individuals and groups. 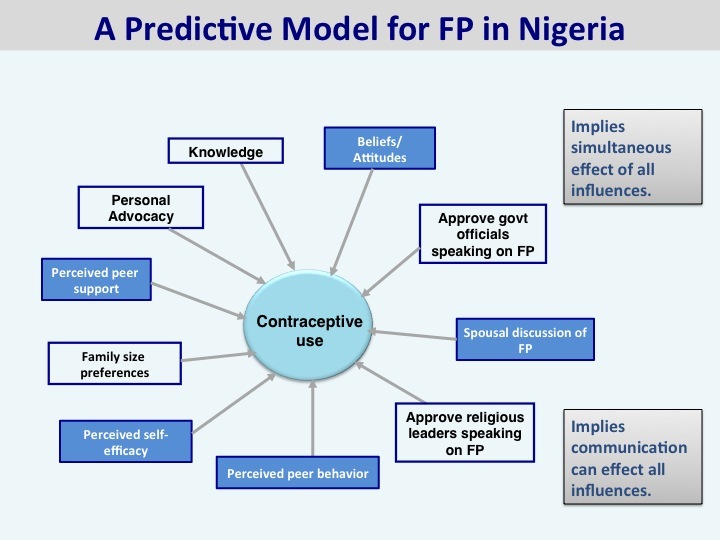 NURHI used the project survey data to construct a Nigeria-specific ideational model for family planning, which is an index of factors that together predict contraceptive use (see “predictive model” diagram below). Click here to see how NURHI used the concept of ideation. The pred ictive model illustrates the 10 different ideational factors used to predict contraceptive use. Ideational factors work together; the more positive ideational factors a person holds, the greater the likelihood that the person will adopt the desired behavior. Prior research has shown that the ideational factors affecting individual FP use include those in the predictive model of communication and change above (Kincaid, 2000). From the beginning of the project, NURHI was designed to address the 10 ideational factors in the above model through its service delivery, advocacy, public-private partnership and demand generation activities. As predicted and planned, midterm survey results indicated NURHI program exposure is positively correlated with change in these important ideational factors, and these ideational factors are themselves predictors of contraceptive use. This ideation model was used to develop program activities to target the key factors that were 1) very predictive of contraceptive use among the surveyed women; and 2) of relatively low prevalence among the surveyed women, and therefore in need of change. For example, knowledge is predictive of use, but knowledge was over 90%, so not in need of targeting in this case; positive beliefs about contraceptives are also predictive of use, but were troublingly low among the population. This indicated a need for concerted work on dispelling myths and misconceptions among women, men, and service providers, all of whom held the same damaging beliefs. This understanding resulted in interventions, such as: the radio entertainment education program that focused on correct information about contraceptives, and the mobile distance education intervention that supported service providers in using medical eligibility criteria, rather than their own biases, in prescribing methods. To learn more about the theory of ideation, click here.